You want to click it bigger. One click. Easy peasy. What a Northern Girl needs. That was a total falsehood lie. The G-Man with the man cold-man flu-northern man flu-whatever. The G-Man, who was down for the count all last week, was beginning to show signs of life over the weekend. I wouldn’t let him shovel any of the weekend snowfall. 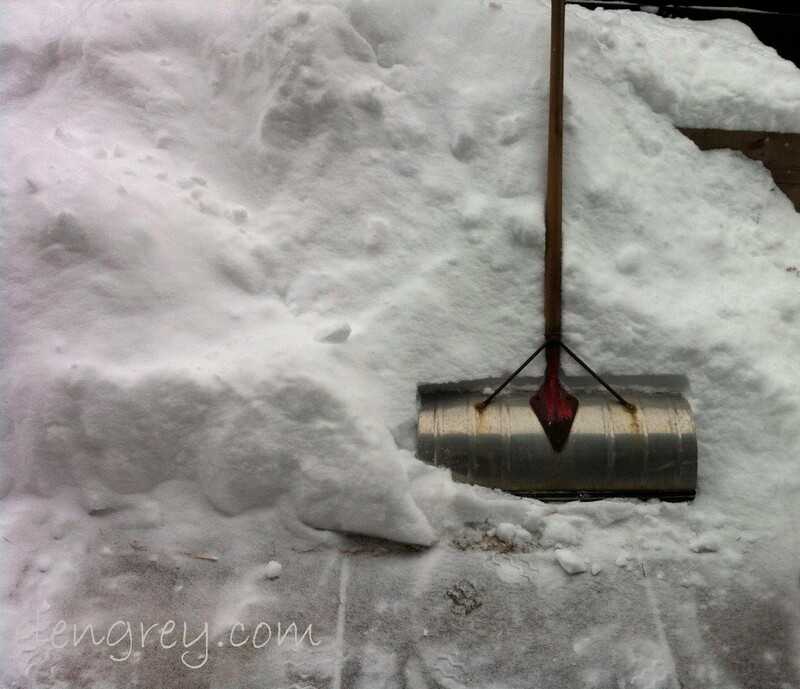 But by Monday, I let him run the snowblower — I’m the best honey ever! — when we got a foot of snow. Mainly because it’s big and powerful and runs on gasoline, and I tend to just gallop along behind it, hanging on for dear life. Until it runs out of gas. And stops. Kind of like the time I had to ride a rider mower all over Essex County until it ran out of gasoline. I had no idea how to get it to stop. It eventually stopped. In a ditch. Or kind of like the time I went skiing with my high school boyfriend and skied right across the blacktop parking lot, because I couldn’t stop. I was asked to not come back, which sucked since my boyfriend worked there. Also humiliating, because there were four-year-olds skiing down the slopes on one ski, and I wasn’t even off the bunny hill, until I skied the parking lot. Or kind of like the time I went bowling with my high school boyfriend and when I let the ball go, it went sailing across five lanes. I was asked not to come back. I’m good with tools and machinery. The boyfriend and I broke up after two proms and a graduation. I think he considered me DEFCON 2. Sadly, this is all true. Good thing the G-Man didn’t ask me to fill out a prenuptial questionnaire. Back to the close shot. This shovel I can handle. There’s a smaller, lighter-weight one that is my very own shovel, but this I can use. That’s because Mr. Fisher taught me how to wield that blade like a pro. How to skim and arc and dump without lifting. How to use my knees and arms, not my back. How to stay upright and not end up in the next snowdrift over. He was a good neighbor. Fingers crossed that I don’t get the woman cold-woman flu-northern woman flu-whatever. It’s no prettier than the man cold. Right, Mr. G? Great stories. When they tell someone not to come back wouldn’t that be the time they could have made a friend for life by working with you on how to “pizza slice” or how to let go of the ball? Like Mr. Fisher, there’s someone who understands a little instruction lives on and on. Ya think? Dr. Fisher was an Ontario artist, an entomologist, a mushroom expert, a micro-mineralogist, and a natural born teacher. He was more than twice my age, and I adored him. And the man could shovel!! Thank you, Gruhn!